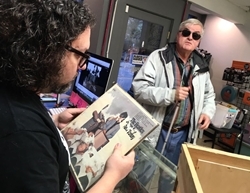 Local blind man has copy of rare Beatles butcher cover album . Beatles Radio: The Beatles, Solos, Covers, Birthdays, News The Fab 4 and More! “Don’t butcher the butcher cover album,” the saying goes. Good advice. This famously rare Beatles record could be worth some serious money. And one local man has a copy he can’t see. Peter Smith, now blind, bought it when he was a child living with his family in Puerto Rico for a spell. “That little 8-year-old boy made a very wise investment,” he said. The 1966 record, called “Yesterday and Today,” originally featured a weird photograph of the Fab Four dressed as butchers, holding slabs of meat and doll parts. Some, citing Paul McCartney’s comments at the time, interpreted the image as a protest of the Vietnam War. It features songs such as "Drive My Car," "Nowhere Man," "Yesterday," "We Can Work It Out" and "Day Tripper." The record company had 750,000 copies made, but the photograph was condemned when it hit radio stations and stores, prompting Capitol Records to recall The Beatles’ ninth U.S. release on its label.